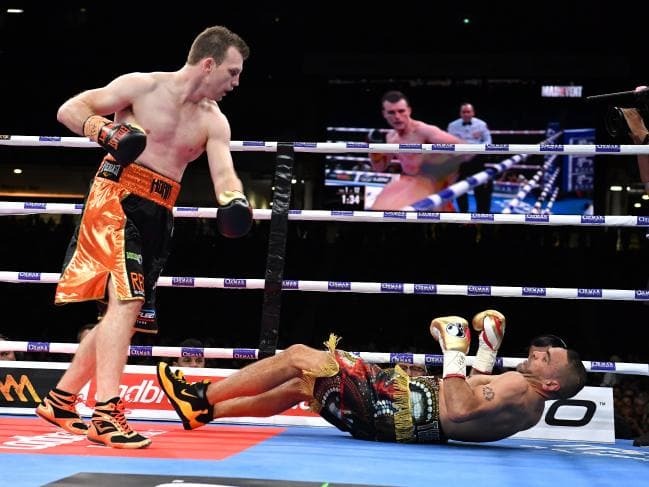 Jeff ‘The Hornet’ Horn 19-1-1 (13) can claim to be the face of Australian boxing after his savage 96 second destruction on Anthony ‘The Man’ Mundine 48-9 (28) at Suncorp Stadium in Brisbane, Australia on Friday night. The fight was contested at a catchweight of 156.5-pounds and the 30-year-old former WBO welterweight champion looked sturdy and powerful at the higher weight from the opening bell. Horn, a former schoolteacher, went on the offensive early, jarring Mundine with an overhand right before ripping into the 43-year-old former rugby league star’s body with heavy-handed shots. “I knew I hurt him with that first one,” said Horn. Mundine tried in vain to slow the pace of the fight but the rampaging Horn wouldn’t be denied. Horn, who shocked the world with his title-winning effort against Manny Pacquiao at the same venue 16 months ago, dug in a shot to Mundine’s belly before returning upstairs with a heavy left hook. The blow crumpled Mundine to the canvas in the neutral corner where referee Phil Austin waved off the fight after a count of seven. “We worked on a lot of things but that left hook while going to my right was the plan all along,” Horn revealed. After struggling to make the 147-pound weight limit for his past two fights it is expected that Horn will move up to the junior middleweight division. “They’ll know I’m more dangerous at this weight,” said Horn, who secured his first win since losing his WBO welterweight title to undefeated American hotshot Terence ‘Bud’ Crawford in June. As expected, Mundine announced his retirement after the fight. Mundine released a statement on Saturday morning thanking everyone who had played a part in his career – from his fans to his “haters”. “I felt good trained hard but that was GODS will,” wrote Mundine on social media. “I’ve had an amazing career of ups & downs I wanna thank every person lover or hater that played a role in my career!